Thanks! I just thought up that I should add a basic damage calculator, or at least a precursor to a basic damage calculator to the battling environment. Good luck on your exams by the way! I could not really figure out how (in the messenger / chat) to make the cursor automatically move up to the beginning line of chat, so I implemented a Robot from AWT as a temporary fix, having it simply press the up key internally whenever a message is sent. A lot of the current things in place are only temporary, and should be changed when more features are available. Ideally, the arraylist containing the user and opponents' pokemon should be obtained through data sent over the server, for example. Outside of making the battle system look more pretty aesthetically, I'm not too sure what else I can work on for it, so please give me suggestions. Hi. So this is the re-uploaded version of all of the project. Please tell me if it works, as well as what I can do next. As I mentioned earlier, I sincerely don't know what to do, and I'm really sorry about that. Perhaps I can try to make another database? I would love to continue working on this, but I guess it's a mixture of guilt and business that has kept me from being able to work on it, and I sincerely apologize for that. By the way the three folders are all supposed to be their own packages in case it was not made clear! The battling environment has been significantly updated - you can now do switches, etc, and the moves change and such. This took me a surprisingly long time to do for some reason. In addition to that, the Pokemon Database (now named "PokemonDatabase", meant to replace the old "PokemonDB) and the Move database (fixed the error where previously the constructors for the moves were default accessor levels, so that ran into a lot of problems. "Psychic" the move is also lower case to avoid confusion with the type Psychic) were also updated. I got it working! You can now perform switching and watch the sprites change, as well as see the moves update. The databases for Pokemon and Moves are slightly more updated - the Move database had previously accidentally been generated with non-public constructors, the Pokemon database can now return the pokemon's national dex number which it could not do before. I will send updates probably tomorrow. In the mean time I'll see if I can do anything else to improve it a little before I send you the updates. Hello. I apologize for not getting back to you for quite a while. In addition to that, I've been rather busy with unexpected things around holiday season so I have not been able to get as much time as I would have liked to develop the code. Anyways, with the time I've been able to get, I've worked on the battling environment some more, and made it look prettier in general. I've added the buttons for selecting the moves as well as switching "tabs" for the view on the moves, spectators, and switching Pokemon. Anyways, here is the download link for the "Battle" package that I've been working on. The name might be a bit screwed up (It's actually the date as of this writing) due to the fact that otherwise I have compression issues for some odd reason. So be sure to delete the numbers after the package name "Battle" so everything works out well. Hello here are the files I've been working on. It creates a JFrame and has all those things in it - it has three individual JPanel inside of the general JFrame: a battle screen (shows the Pokemon and stuff), chat messenger, and an action selector (for selecting moves). The individual JPanels have their own classes, titled appropriately, and all of them extend the more general "GUI", which forms like kind of a base. I decided to make a Pokemon database using a script, having been inspired by a friend to do so. The database works similar to the move database - each individual Pokemon passes its name, stats, etc to its super class, "Pokemon", which also has getter methods for those stats. At the moment, there are not any images, but I should add them so each entry in the database is more complete. 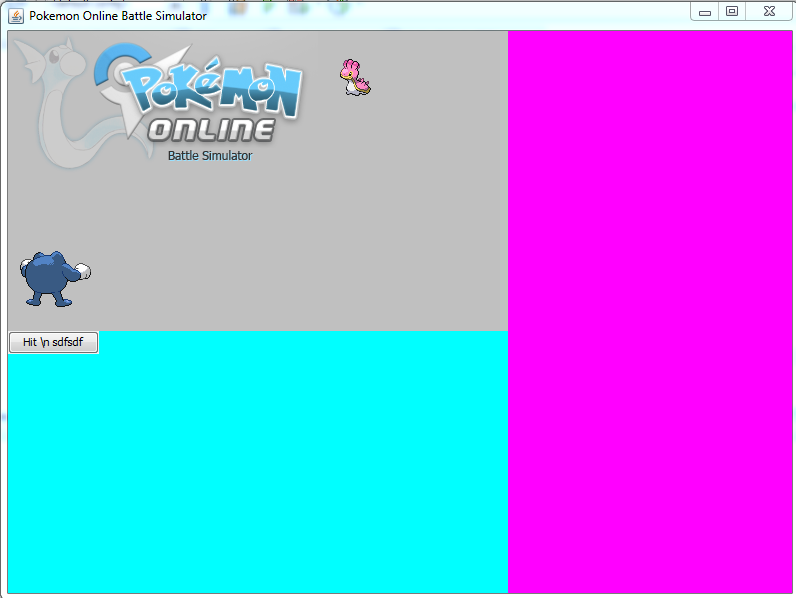 The coloured areas are not final, but merely indicate the areas where the Pokemon sprites are displayed - gray, where the actions such as performing switching etc are performed - blue, and the chat messenger - pink. At the moment, the button in the blue area replaces the current two Pokemon sprites on the screen with two new Pokemon sprites via a method called "imageUpdate", that takes two arguments, which are the two new images to replace the existing ones with. This will be helpful when switches are performed, for example. Hi! What about I try to start on the battling environment? Cool. Is there anything else you'd like me to do? Hi. In the giant "Move" package, hidden deep in the various move classes is "Move.java", which "SpecialMove.java", "PhysicalMove.java", and "StatusMove.java" extend. In turn, every other move extends their respective categories. In each of the individual move files - let's use "Absorb" as an example, upon calling the constructor it passes into the super constructors the following values in this order: damage, power, pp, type, short description, and 'physical'. I plan to change 'physical' into physical contact later - some moves like Earthquake don't exactly touch the opponent, and others like Grass Knot, though a special attack, touches the opponent. Anyways, those values in the super constructor gets passed up all the way to "Move.java", whose constructor sets those values and provides getter and (i think) setter methods for getting the move power and such.